As mentioned in various media critiques, these two groups of earners are different enough to treat as entirely different populations. In this post, the first of three on this topic, I look at some of the key differences between these two groups of mothers, and examine earnings trends relative to these differences. As opposed to using the term “breadwinner,” I describe married mothers earning more than their husbands as “primary earners”. “Not primary earners” describes married mothers earning exactly as much as, or less than, their husbands, including those not participating in the workforce. Unmarried mothers are those Pew describes as “single”. For now, I assume that single mothers are the primary—in fact, sole— earners in their households, though I’ll consider alternate definitions of “single” in my next post. Salary and wage income refers to pre-tax income earned through employment, while household income totals all income sources from all earners over the age of 15 in a household. Household income includes income from sources such as welfare and social security as well as earnings or losses from personal investments. In general, and in keeping with Pew’s findings, married-couple households have notably higher income than single-mother households. This is true no matter which partner earns more. That is, of course, not very surprising, since it is likely that these houses have two incomes. We also see that married women are slightly older than unmarried women, and have slightly younger children. This may because single mothers are, on average, younger (25.6) at the birth of their first child than are married mothers (28.3). Looking at wage income, we see that married primary earners tend to out-earn single mothers, a difference that cannot be directly attributed to the presence of a spouse. Many factors may account for this earnings differential. We’ll start with a few obvious possibilities: education and hours worked. 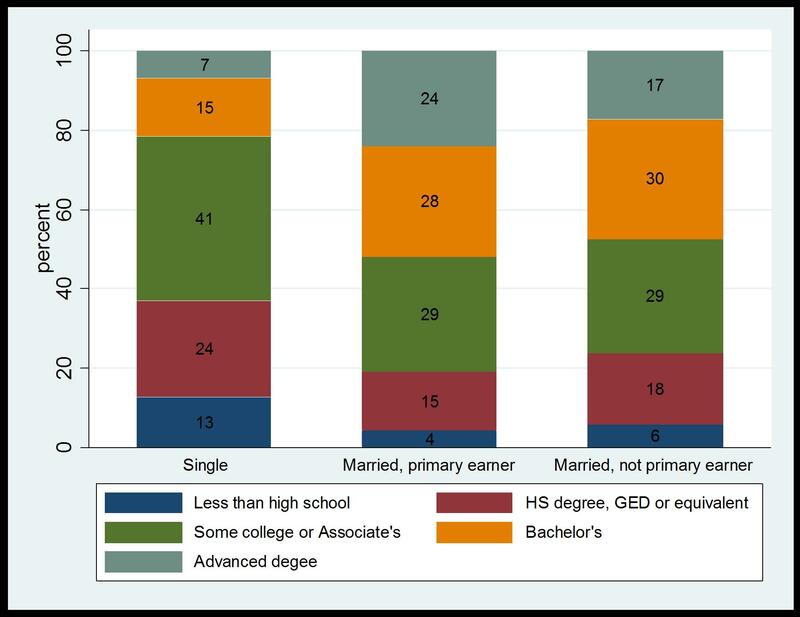 As displayed by stacked bar graph above, married mothers—primary earners or not—are far more likely than unmarried mothers to have a Bachelor’s or advanced degree. This education differential may play some role in the difference in median wage and salary income, since more educated workers have higher earnings potential. However, as we saw in the post’s first table, non-primary earning mothers still earn less than single mothers, suggesting an important consideration: earnings potential may not always align with workforce participation. For example, women with Bachelor’s and/or advanced degrees are likely to be married to well-educated men with high earnings potential of their own (about seventy five percent of married mothers with at least a Bachelor’s degree are married to men with similarly high educational attainment*). In this case, the presence of two potentially high earners in a household may yield the opportunity for one to opt out of paid employment. With that in mind, it’s important to take into account employment statistics among these different groups. Specifically, while approximately seventy four percent of single mothers are actively employed, only fifty nine percent of non-primary earning mothers are currently working, contributing to lower median earnings as a group. However, even limiting our examination to employed mothers of the same educational levels, we still see differences in salary and wage earnings across these three groups of earners. Large wage discrepancies between the wages of married primary earning women and unmarried mothers persist across all levels of educational attainment. Deeper examination also shows differences in hours worked. Across all educational levels, primary earning married mothers work more hours per week than their single counterparts who, with the exception of the least educated, work more than non-primary earning married mothers. This pattern reflects what we know about work and child care: all parents face a trade-off between work and childcare, but choices are more restricted for single parents. Some married mothers who are employed, but earn less than their spouses, may work less than full time in order to provide at-home child care; this may contribute to fewer hours worked, overall, for this group. Married mothers who out-earn their husbands may rely on their partners for some child care, or may devote some household income to paid child care, allowing them to work more. Single parents’ child care options may be more limited—for example, due to the prohibitive cost of child care—perhaps influencing, or even necessitating, a decision to work fewer hours in order to be present with children themselves. While we might expect single mothers to work more once their youngest children are old enough to attend school, it turns out that there are no substantial changes in hours worked per week among mothers with older children: married primary earning mothers continue to work more hours, at every educational level, than do employed single mothers. It is important to note that this division between married and unmarried disregards the rising trend of cohabitation without marriage, particularly among younger couples. My next post will explore differences in employment patterns between various demographics along an alternative division: coupled (married or cohabitating) v. single. In a final post on this topic, I will focus exclusively on the population of single women living without a partner in order to compare earnings trends between “never-marrieds” and those who have been married at least once. *This statement revised August 12, 2013. Annie Rorem is a Policy Associate at the University of Virginia’s Weldon Cooper Center for Public Service where she conducts research in the areas of education, labor market participation and gender roles.